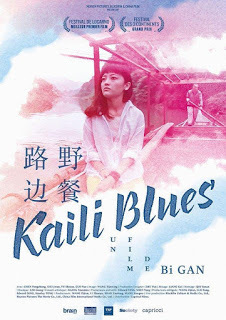 The following synopsis is going to severely under-sell Kaili Blues, but here goes: Chen (Yongzhong Chen) is a reformed ex-con living in China’s Guizhou province. He operates a small medical clinic with an elderly colleague, although of late he has become concerned about how his disreputable brother is treating his nephew Weiwei (Feiyang Luo). When he learns his brother has sent Weiwei away, and has even discussed selling the boy, he heads off to recover Weiwei and bring him home. He also finds himself roped in to returning a cassette tape of pop music that was given to his colleague by a lover many years earlier. ‘Arthouse’ is a term that gets thrown around in film criticism in a manner that often suggests that the critic has simply run out of better words to use. It can indicate all manner of things to all manner of writers. For some it will mean experimental narratives, editing or photography. For others it will signify a lack of narrative at all. For yet more writers it is simply a shorthand for directorial pretence. The word has been thrown at Kaili Blues an awful lot, in this case because the first time around the film really is remarkably impenetrable, and it is only once out on the other side that its immense merits become clear. This is essentially a film of two halves. The first is a quiet character drama told in a very restrained and leisurely fashion. The story unfolds in a deliberately piecemeal fashion: we are not properly introduced to characters one by one, and are largely left to work out the relationships for ourselves. There’s a heavy use of ellipsis in effect: we don’t necessarily see the beginnings and ends of scenes. This could all get rather annoying were it not for the wonderful and understated performance by lead actor Yongzhong Chen, and for the film’s exceptional mise-en-scene. Shot on location in the relatively poor Guizhou province, the film has a striking level of grit and realism. The handheld camera work gives it a documentary-like feel, and the mountainous terrain and misty forests give the whole picture a wonderfully rich look. It all moves rather slowly as well, and while the languid pace initially frustrates it soon frees the viewer to actually study and soak in all of the background detail. There is a sense of place to this film that I haven’t experienced so strongly in a long while. What is likely to dominate conversation about the film, however, is the bravura tracking shot that commences at about the halfway mark. It goes from road to boat, down a river, up a hill, across a dizzingly high bridge, through a ramshackle township and away up the road on the other side. It involves a good dozen or so characters plus extras, and weaves in and out of their stories. All of this, in a single handheld shot that lasts for 41 minutes. Chen is the through-line for this sequence: we enter and exit with him, and get to glimpse all of the other details as he goes. It is a strange town: as the residents talk we hear echoes and glimpses of previous conversations in the film. It is never really made clear, but it really does seem like all of Chen’s past regrets, present concerts and fears for the future have all coalesced into one village. At the time of watching it it is maddening, but as the closing credits roll it all seems utterly remarkable in retrospect. The camera work here is remarkable: the film has clearly been made on a very low production budget, but the images that we see are world-class. This film marks the directorial debut of poet-turned-filmmaker Gan Bi. Based on this remarkably original and thoughtful first attempt, I am extremely keen to see where his career takes him next. This film is not going to be for everybody, but it does offer a distinctive and wonderfully imaginative ride. This review was first published at The Angriest on 5 August 2016. This is certainly one that I’ll have to rewatch some time in the future. I first saw it in December and while I could appreciate the film’s technical aspects, I didn’t understand a whole lot of it. It’s a very interesting film to say the least. Great review!